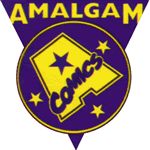 Thought Balloons - Creating Comics One Page At A Time: Why Amalgam Comics? In 1996, DC and Marvel locked horns in the battle royale crossover imaginatively titled Marvel vs. DC. Heroes fought heroes for a poor reason, in the ultimate epitome of mainstream 90s comics. It was, essentially, just a punch-fest. But then something unexpected happened. The universes merged, creating the Amalgam Universe. Characters fused together to create new ones -- e.g. Superman and Captain America became Super-Solider, Batman and Wolverine became Dark Claw. For one month, Marvel and DC ceased regular publishing to produce these amalgamated issues. While fun was had with this concept -- finding all sorts of ways to combine various elements -- I always felt that it still had so much untapped potential. 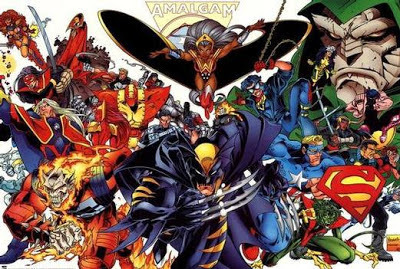 While it is highly unlikely we will ever see Amalgam Comics start up again in this day and age, we here at Thought Balloons (and you at home, in the comments below) can play around with this new, yet familiar, world. A complete list of Amalgam characters can be found here (and a more extensive list, covering objects, places and other miscellanea, here), but do not feel confined only to what has come before. If you have another idea for two characters you'd like to see become one, go for it. Maybe you'll tell just a straight up adventure, or combine two classic origin stories, or maybe even try and fuse two big comic book events. Whatever scale you go for, this is sure to be a fun writing challenge. For more inspiration, I highly recommend this fellow's site. He keeps the spirit of Amalgam Comics alive by creating interesting new combinations. I used to have all the collections of these titles once, so fun! I have one or two left now. What were people's favourite combinations? I think Dr. Doomsday wins for me in name alone. Amazon is a combination I adore, Storm plus Wonder Woman is just pure gold!